Today I want, more than anything, to be as resilient as Alexander. Yesterday he broke his arm. Today he is conquering the world (with his wee, bitty cast). 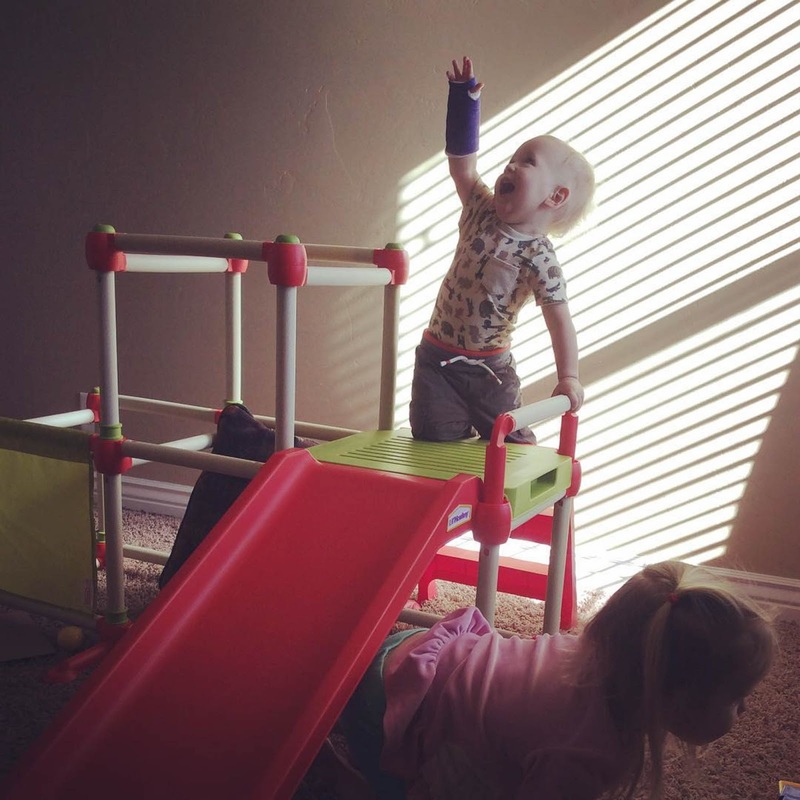 It took him a few tries to figure out how to climb his slide with his cast on, but he did it! He's been so cute to watch as he figures out how to do all the things he'd thought he'd had figured out before. This morning he grabbed a block with his good hand and used it as a crutch—it made his good arm as long as his casted arm (since he's using the knuckles of that hand instead of his palm)—to hobble-crawl across the room. He's been experimenting with walking on his knees and has even gotten up to walk (some very short distances) of his own volition! Climbing isn't quite as easy as it once was because he can only grip things (ladders, benches, etc) with one hand, but that doesn't stop him from trying. He's just as happy to colour a picture with his left hand as he is his right. He's also completely unperplexed by feeding himself with his left hand (though he did bite his fingers a couple of times already). I've been fairly certain that his right hand is his dominant hand (because that's the hand he's always used to colour with or to hold his fork and so forth) but I'm wondering if this experience will cause his brain to rewire him into a genuine south paw. There's evidence that spending just two weeks with your dominant hand out of commission will lead to significant increases in non-dominant hand agility—but that's only for adults where a two week period represents only 1/468* of their life (for an 18-year-old! Alexander is looking at having this cast on for a month. That'll be 1/16* of his life by the time it comes off (whereas it would only be approximately 1/429* of my life)! Having this cast is no small thing for him! But he's taking it like a champ! *Assuming I did my math right, and based on each year having exactly 52 weeks.